Cumhuriyet journalists and executives face trial beginning Monday 24 July for abetting the failed 15 July 2016 coup against the government of Recep Tayyip Erdogan. People gather in support of the Cumhuriyet defendants as the trial got underway. 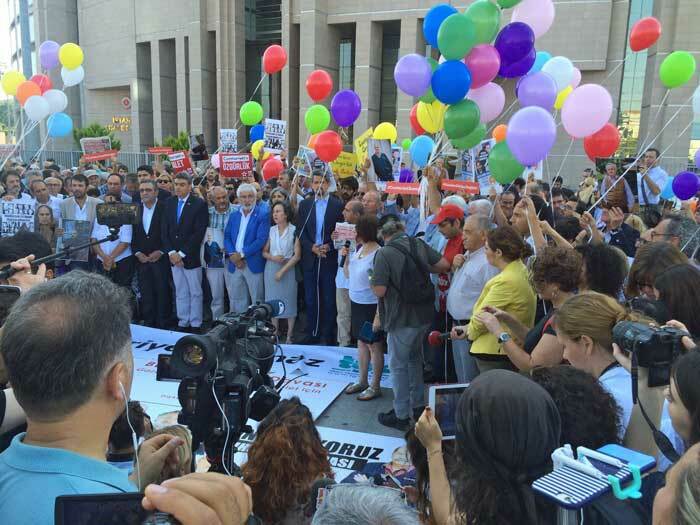 Executives and columnists of Turkey’s critical Cumhuriyet daily go on trial this week, beginning Monday 24 July. The indictment seeks prison sentences for the defendants varying between 7.5 to 43 years. The charges for those on the board of the Cumhuriyet Foundation, which oversees the newspaper, include “abuse of power in office,” but all are accused of “supporting terrorist organisations” mainly through changes that have occurred in the paper’s editorial policy following the election of a new board to the foundation in 2013. The prosecution’s claims are supported by views of several media experts — most of whom are former executives or employees terminated from various positions, according to Aydın Engin, a Cumhuriyet columnist who is also a defendant in the case although he was released pending trial due to his advanced age. Indeed, the 435-page long document laments, page after page, that Cumhuriyet ditched its traditional, Kemalist, unyieldingly secularist and statist editorial policy and became a more open-minded newspaper. The prosecutor states that by altering its editorial stance, the newspaper became a supporter of the so-called Fethullahist Terrorist Organization (FETÖ/PYD) — the name Turkish authorities give to the Fethullah Gülen network, which they say was behind last year’s coup attempt –, the Kurdistan Workers’ Party (PKK/KCK) and the Revolutionary People’s Liberation Party/Front (DHKP-C); three organizations with unrelated if not completely opposing worldviews. “A newspaper changing its editorial policy cannot possibly be the subject of an indictment,” Engin says. But really, who are those in prison? 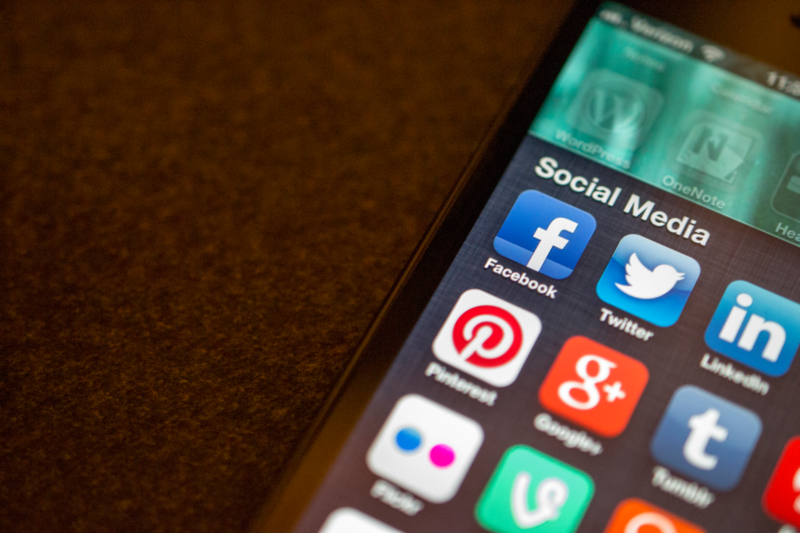 Index on Censorship monitors press freedom in Turkey and 41 other European area nations. 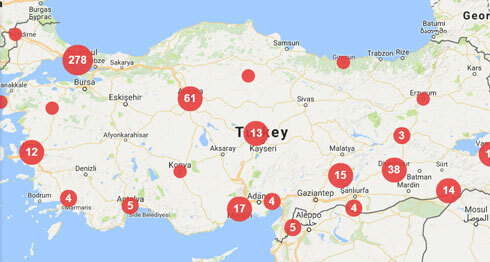 As of 24/07/2017, there were 496 verified reports of media freedom violations associated with Turkey in the Mapping Media Freedom database. Atalay graduated from İstanbul University Law School in 1985. 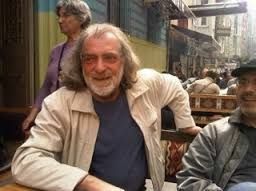 He has acted as the founding member of a number of civil society organisations and his academic studies on press freedom and the law have appeared in a large number of academic journals and newspapers. Since 1993, he has represented Cumhuriyet columnists and reporters as legal counsel. Currently, he is the newspaper’s executive president. Utku has worked as an attorney for 33 years. Since 1993, he has worked as a lawyer for Cumhuriyet columnists and journalists. He is also a member of the Cumhuriyet Foundation’s Board of Directors. Sabuncu has been a journalist for 20 years. He started working at Cumhuriyet in 2014 as the newsroom coordinator. In July 2016, he took the helm as editor-in-chief. A journalist of 28 years, Gürsel started writing columns in Cumhuriyet in May 2016. He assumed the position of publications advisor for the newspaper in September 2016. Öz has been a journalist for 21 years. He has worked at Cumhuriyet since 2006. He is a columnist for the newspaper and has been its ombudsman since 2013. Öz is also on the board of directors of the Cumhuriyet Foundation. Önder Çelik has been a newspaper administrator for 35 years. 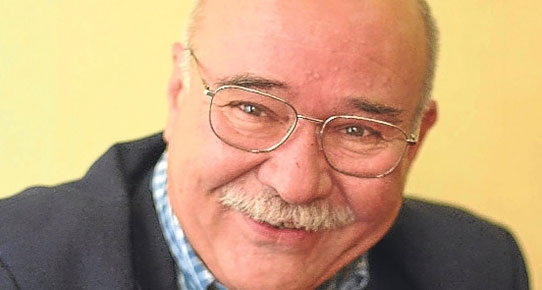 He has worked as the print coordinator for the newspaper between 1981 – 1998. He returned to the same position in 2002 after a hiatus. He has been an executive board member since 2014 as well as a board member of the foundation. A journalist for 48 years, Günay has been with Cumhuriyet since 1987. 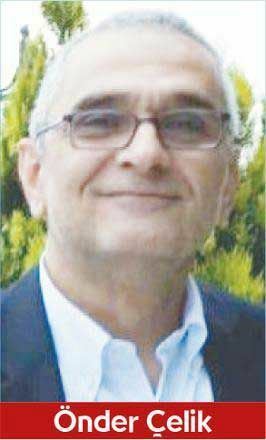 For the past 25 years, he has worked as the chief editor for Cumhuriyet’s literary supplement, the country’s longest running weekly publication on books. The indictment insists he is a board member of the foundation; although he isn’t; a fact he reiterated in his testimony to the prosecutor. Musa Kart, one of Turkey’s most renowned cartoonists, has been drawing political cartoons for 33 years. He has been a Cumhuriyet journalist since 1985. For the past six years, Kart has drawn the front-page cartoons for Cumhuriyet. Hakan Karasinir has been a journalist for 34 years. He has been with Cumhuriyet for 34 years. In the past he has held various editorial positions, including serving as the newspaper’s managing editor between 1994 and 2014. Since 2014, he has also written columns in the newspaper. Mustafa Kemal Güngör has been a lawyer for 31 years. He has defended Cumhuriyet journalists and columnists in court since 2013. 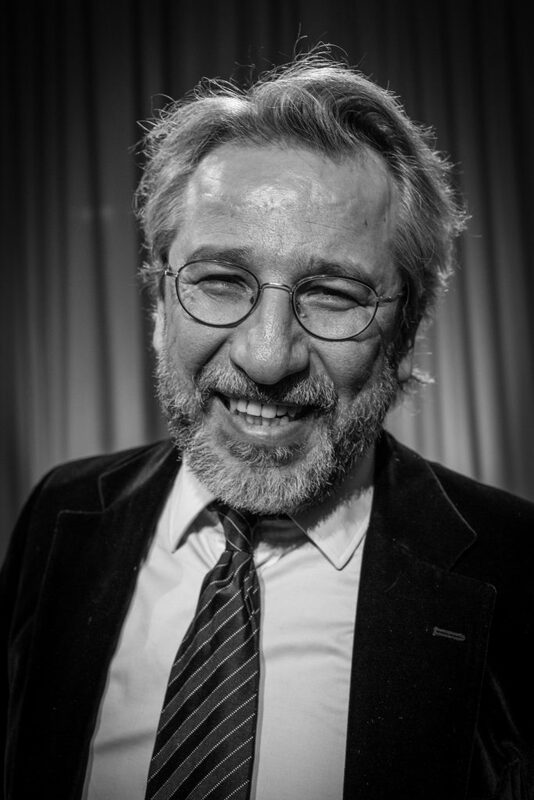 Perhaps the most internationally famous of all Cumhuriyet defendants, Can Dündar was the editor-in-chief of Cumhuriyet until August 2016. He was arrested in November 2015 after Cumhuriyet published footage suggesting that the Turkish government sent weapons to armed jihadi groups in Syria. He was released in February 2016, a few months after which he moved to Germany where he currently resides. Veteran journalist Orhan Erinç, who worked for Cumhuriyet as a young reporter, returned to the newspaper in 1993 as its publications advisor. 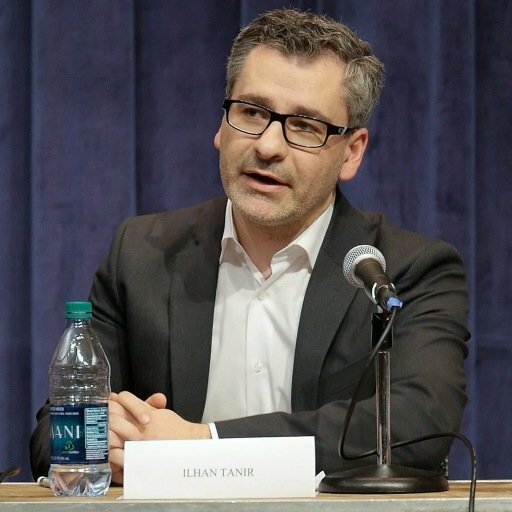 For nearly half a decade, Erinç also held the position of vice president at Turkish Journalists’ Association. He is also a columnist for Cumhuriyet. Cumhuriyet columnist Aydın Engin has been a journalist since 1969. He has participated in the founding process for many news outlets, including Turkey’s Birgün daily. 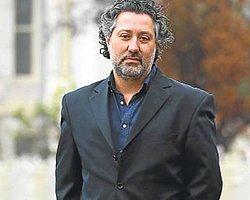 He worked as a columnist and reporter for Cumhuriyet between 1992 and 2002. He returned to the newspaper in 2015. Çetinkaya has been with Cumhuriyet for three decades. 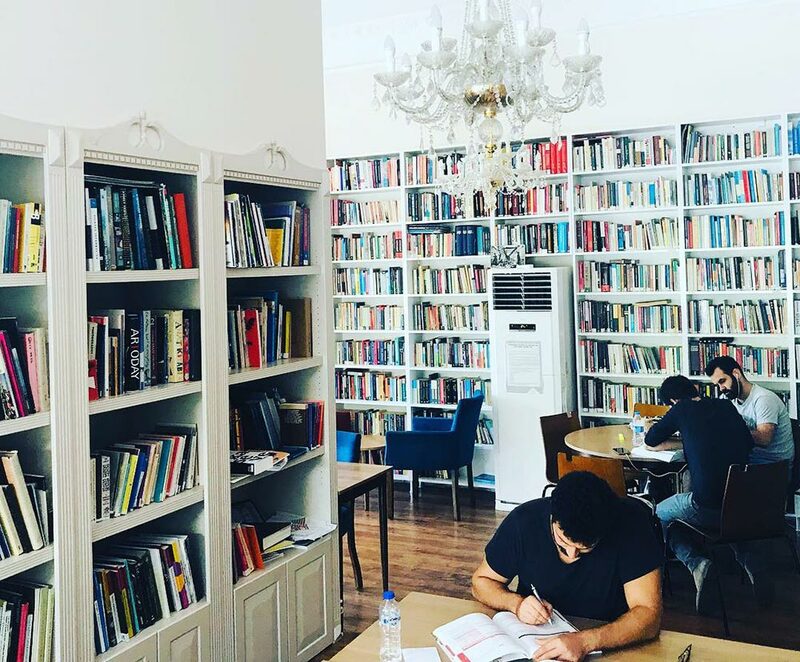 In the past, the columnist worked as the İzmir Bureau Chief of the newspaper. He was also tried in 2015 along with Cumhuriyet columnist Ceyda Karan for reprinting the Charlie Hebdo cartoons in his column. No stranger to Turkish prisons, Ahmet Şık worked as a reporter for Cumhuriyret, Evrensel, Yeni Yüzyıl, Nokta and Reuters between 1991 and 2007. He remained in prison for a year in 2011 in an investigation about a shady gang called Ergenekon, believed to be nested within Turkey’s state hierarchy. He is known as one of the most vocal critics of the Fethullah Gülen network. İlhan Tanır previously reported from Washington for Cumhuriyet. His reports and analyses have appeared in many national and international publications. He currently resides in the United States. A former financial affairs manager with Cumhuriyet, Bülent Yener was released after one day in custody. 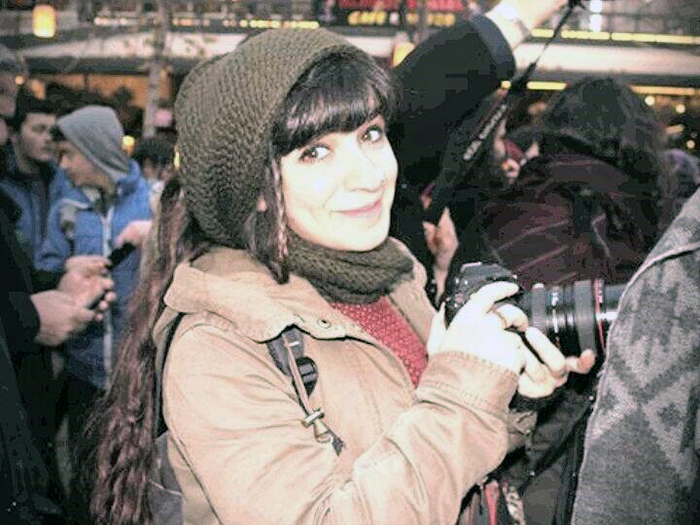 Günseli Özaltay, the newspaper’s accounting manager, was released after one day in custody.